The success of our Paris Balloon and Music Festival is in large part due to our volunteers. We appreciate volunteers who come out to the festival, meet new people and have a great time. Men, women, and young adults generously volunteer their time and energy to make sure the event runs smoothly and that our guests have an awesome time. We are looking for volunteers for 2019 to help before, during and after the event. They provide guest services, balloon coordination and safety, set-up and logistics, The variety of needs allows just about any person, with any skills, talents or interests, to experience the Balloon Festival from a new perspective. 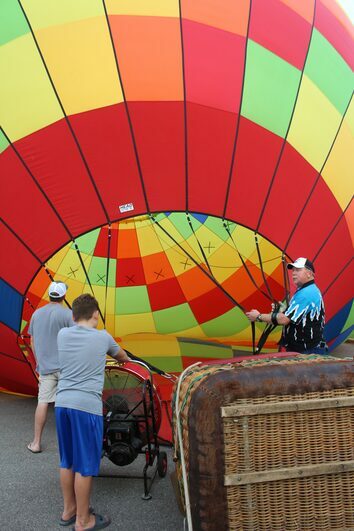 EVENINGS - Balloon Glow - Must be 18 or older, you will assist with the inflation and operations of the hot air balloons during the balloon glow, Friday and Saturday evenings July 19 & 20. Must be at the fairgrounds at 7:30pm for check in and quick briefing. MORNINGS - Balloon Launch - Must be 18 or older, you will assist with the inflation, launch and part of the chase crew from the ground, Saturday and Sunday mornings July 20 & 21. Must be at check in at 5:45 am for a quick briefing. General Information and Guest Services: Volunteers will help direct guests, take tickets, and may help in the vendor building.